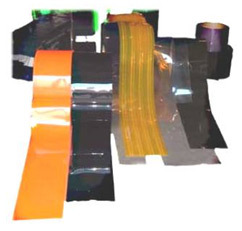 We offers bulk Vinyl materials for a variety of applications including cooler and freezer applications, warehouse and loading doors, welding applications, conveyor openings, anti static and clean rooms, reach through windows and many more. Vinyl Rolls can be ordered in full or partial rolls. When purchasing Vinyl Rolls online our unique punching and perforation service is also available. Vinyl Rolls can be ordered "cut and hole punched" for easy installation. Extruded with a bumper that runs vertically at 2" centers. Acts as a buffer and pro-longs the life of the strip. Will not scratch as fast as standard. Formulated with additives that eliminate and prevent static build up and discharge. Ideal for Clean Room applications. Used for welding screen applications or as a partial sight barrier. Available in widths from 8" to 48" - thicknesses from .080" to .120". Used in application where insect control is needed. Material contains a unique citronella based formulation which deters insects. Common for doors in food manufacturing and processing. Available in widths from 8" to 12" - thicknesses from .080" to .120". Distorts clarity while allowing light thru. 8" to 12" and thicknesses from .08" to .120".